Gold prices broke a multi-week consolidation range last week with the subsequent sell-off defending the January range lows. These are the updated targets and invalidation levels that matter on the XAU/USD charts. 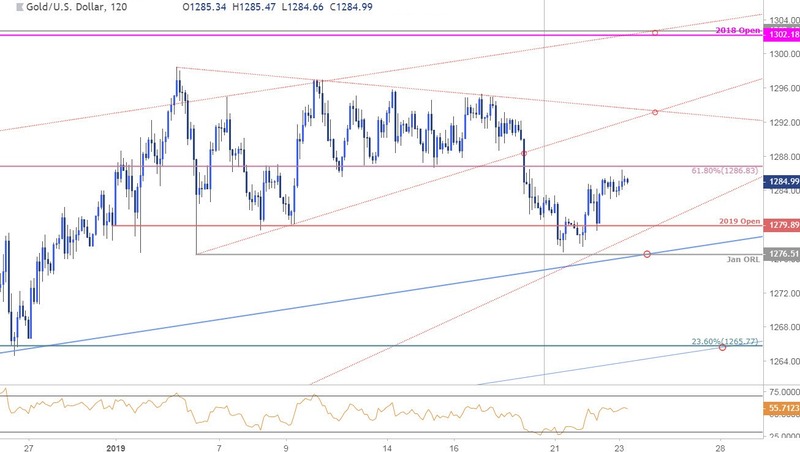 Technical Outlook: In my latest Gold Weekly Technical Outlook we highlighted a pending consolidation break in price while noting that the broader long-bias remains vulnerable while below 1302, “a breach there is needed to mark resumption of the broader uptrend with such a scenario targeting 1321.” Gold broke to the downside with the decline testing the January opening-range lows at 1276 early in the week – a break / close below this level would shift the focus lower heading into the close of the month with such a scenario exposing the 23.6% retracement of the August advance at 1266. Notes: A closer look at price action highlights the breakdown with a near-term recovery in price now targeting initial resistance at 1286. 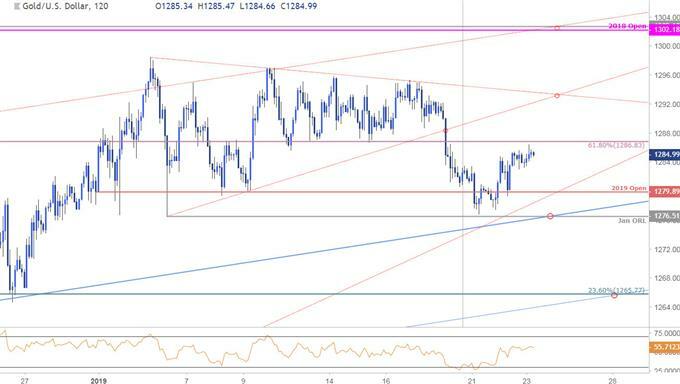 Ultimately a breach above the slope confluence around 1293 would be needed to fuel another attempt at 1302. Initial yearly open support rests at 1280 backed by 1276. Bottom line: The breakdown of a multi-week consolidation structure in Gold does leave the risk lower, but price needs to break the monthly range lows to validate a deeper correction. 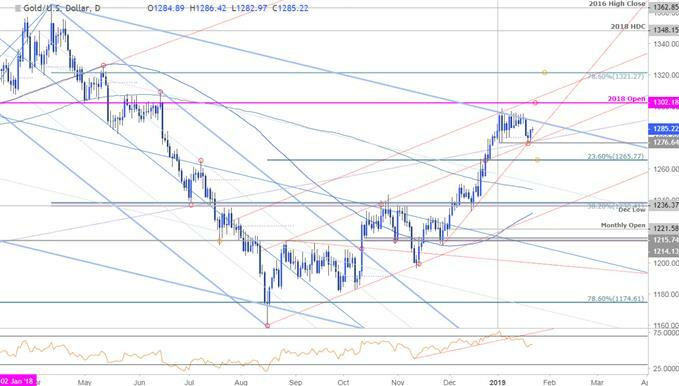 From a trading standpoint, the near-term focus is lower sub-1293 but we’re looking to fade weakness – ultimately a larger pullback would offer more favorable long-entries targeting a topside break of this multi-year pitchfork resistance. 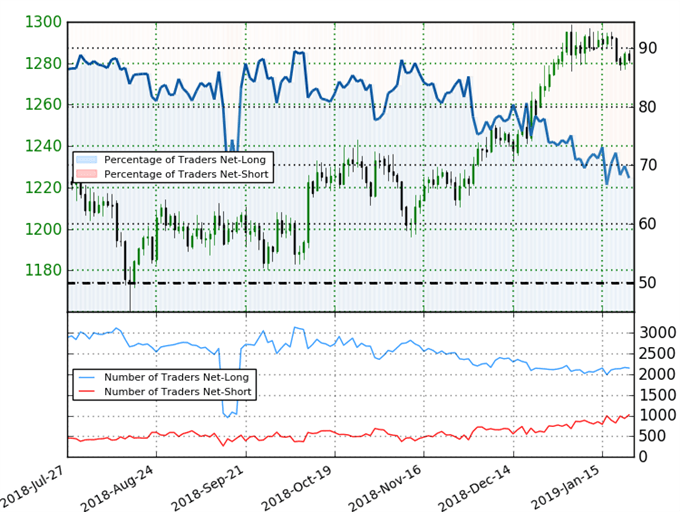 We typically take a contrarian view to crowd sentiment, and the fact traders are net-long suggests Gold prices may continue to fall. 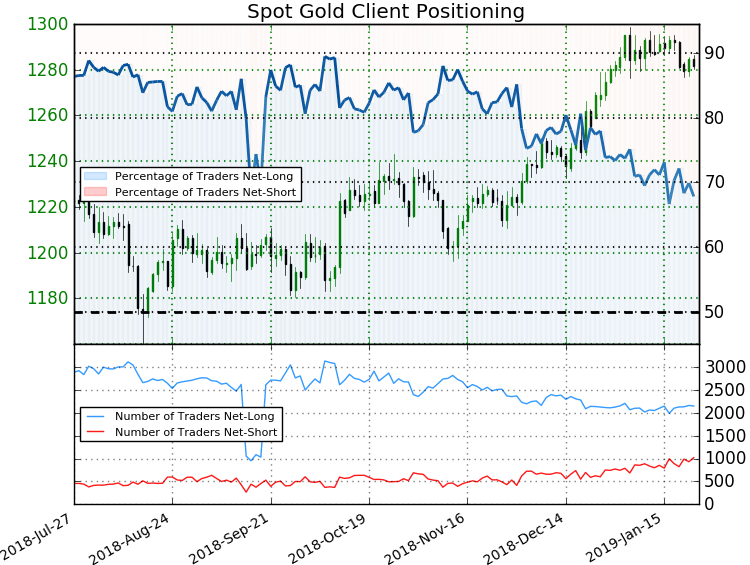 Yet traders are less net-long than yesterday & compared with last week and recent changes in sentiment warn that the current Gold price trend may soon reverse higher despite the fact traders remain net-long.